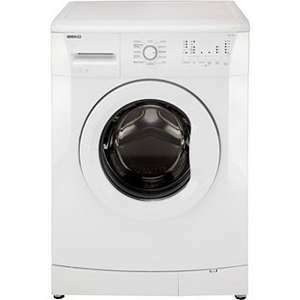 This Beko 7kg washing machine with 1200 spin is large enough for 35 t-shirts or a double duvet so ideal for families. Its slim depth means you will find it easier to install and perfect for confined spaces. Featuring 11 programmes, including a special dark care programme, designed to reduce fading on your darker clothes. The machine also has a pre wash, rinse hold, extra rinse and a timer delay. This means you can delay the start time and make the most of off peak energy tariffs. Clothes not that dirty, you can wash a full load in just 28 minutes, this super fast programme will save you time when you need things clean fast. Up to 9 hours delayed start. Overflow protection to help prevent water leakage or overflow. 28 minute 30 degree wash. Estimated annual energy consumption: 210kW/year. Estimated annual water consumption: 9020litres/year. Boxed size H89, W65, D60cm. Personally I wouldn't buy a cheap washer as you are asking for trouble. Save up for a Bosch instead especially if you are using it a lot. Personally I wouldn't buy a cheap washer as you are asking for trouble. … Personally I wouldn't buy a cheap washer as you are asking for trouble. Save up for a Bosch instead especially if you are using it a lot. the engineer recommended 3 brands for washing Machines - Siemens, Beko, Bosch - so hence my choice of Beko! Washing machine runs smoothly,the capacity is good,doesn't make noise. washing comes out very clean with lots of washing options. The manual was easy to read and installation was very easy. And delivery was on time. Am really pleased with my purchase! I've had a Beko washing machine for 7 years and had no problems whatsoever with it. I was told by a washing machine engineer, buy the cheapest model on the market, and when it breaks just renew it . Asked my engineer who was fixing my Bosch dishwasher...the engineer … Asked my engineer who was fixing my Bosch dishwasher...the engineer recommended 3 brands for washing Machines - Siemens, Beko, Bosch - so hence my choice of Beko! Thanks...you too, since my engineer recommended Bosch and Beko so we are both in with a fair chance. Better to find £369 and go for the Samsung Ecobubble with the 5-year guarantee included, as at least then you know it's good for five years plus you would save money due to the Samsung A+++ energy rating. The EU specifies a minimum number of washes a washing machine must reasonably be expected to perform before breaking, approx 1150. A cheap washer can last as long as an expensive one. If you only wash once per week it will last longer than one in use 2/3 times per day (larger family), the same machine WILL fail sooner on the most used. Majority of machines no longer have replaceable bearings, the whole tub has to be replaced. Many have 'sealed tubs' to help lower green emissions in production (another EU requirement). By meeting the minimum requirements manufacturers are aware a %age of machines will need replacing sooner than later. Get a cheap machine and extended warranty if you use it lots, it is well worth it. Plus newer machines do come in with better tech, so having a machine lasting you 10 years sounds ok, but may cost more in power. Being short of cash I did a lot of research before buying a new machine last year hence the above. I bought a Logik from Currys and a 5 yr warranty for a little over £250 (on offer). My machine does approx 13 washes per week, so expect it to last no longer than 2 1/2 yrs. Said it before and will say it again.The EU specifies a minimum number of … Said it before and will say it again.The EU specifies a minimum number of washes a washing machine must reasonably be expected to perform before breaking, approx 1150.A cheap washer can last as long as an expensive one. If you only wash once per week it will last longer than one in use 2/3 times per day (larger family), the same machine WILL fail sooner on the most used.Majority of machines no longer have replaceable bearings, the whole tub has to be replaced. Many have 'sealed tubs' to help lower green emissions in production (another EU requirement). By meeting the minimum requirements manufacturers are aware a %age of machines will need replacing sooner than later.Get a cheap machine and extended warranty if you use it lots, it is well worth it. Plus newer machines do come in with better tech, so having a machine lasting you 10 years sounds ok, but may cost more in power.Being short of cash I did a lot of research before buying a new machine last year hence the above. I bought a Logik from Currys and a 5 yr warranty for a little over £250 (on offer). My machine does approx 13 washes per week, so expect it to last no longer than 2 1/2 yrs. 13 washes per week!! We do prob 2-3 washes per week, so by your logic, this was the right machine for me? 13 washes per week!! We do prob 2-3 washes per week, so by your logic, … 13 washes per week!! We do prob 2-3 washes per week, so by your logic, this was the right machine for me? ​My first Bosch Exxcel lasted 7 years before the sealed bearings went and just bought a Bosch Maxx instead. We wash about once a day. The guy in the shop said 7 years was poor and should have lasted longer. I might consider the cheaper washer and extended guarantee but not sure how good or bad curries are when you have a problem. ​My first Bosch Exxcel lasted 7 years before the sealed bearings went and … ​My first Bosch Exxcel lasted 7 years before the sealed bearings went and just bought a Bosch Maxx instead. We wash about once a day. The guy in the shop said 7 years was poor and should have lasted longer. I might consider the cheaper washer and extended guarantee but not sure how good or bad curries are when you have a problem. Why go for a cheaper washing machine and pay for a 5 year warranty, when the Samsung Eco Bubble comes with a 5 year warranty? Think of the water and energy usage (which costs) too over the lifetime of the machine. ​I wasn't sure about Samsung as they are relatively new in the washing machine market. I also read on a forum that someone had to wait ages for parts. Bosch are well established now and have a good reputation. I guess I just didn't want to take the risk. 5 adults all work and heavily involved in sports. Costs a fortune. * Please note item 2441636 has previously been on sale at 169.99.